FAQ: What are the specifications and options for large drinking water tanks? Question: Can you provide me a technical specification on a large (250,000 gallon) drinking water storage tank? I'm looking for pressure ratings, inlet and outlet sizes, bedding material, etc. Where will you be storing this tank? How much space you have available? What type of water storage are you looking to achieve? How long are you planning to store the water? 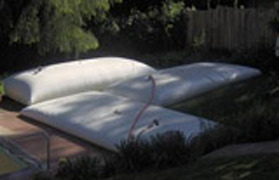 Knowing these facts can help use to determine the best type of drinking water tank fabric you will need for your location. Fabrics for these tanks typically come in three different thicknesses that correspond to a rated contact time of either 1 year, 3-5 years, or 7 years. This contact time is designed to act as the rated amount of time the fabric on your tank will last before it begins to change. It is not a specific lifespan for your tank. Due to the size of these tanks, we also offer a typically crate size so you can get an idea of how this tank will be sized when it is compacted. Storage crate size for these tanks is typically 12 feet in length, 5 feet in width and 5 fee in height. Pressure ratings for all our tanks are typically 0.5 PSI. Fittings for these tanks can vary depending on what you need to store. Standard tanks will come with 3/4" through 2" standard fittings. 4" through 6" available upon request. Choose from Aluminum, Stainless steel, Polypropylene with Camlock, Storz or threaded fittings to accommodate hoses. Ball valves, pressure relief vents and caps are also represented. For high volume water storage, you may find that a corrugated steel tank fits your needs best. We're happy to talk to you about available solutions, based on your specific project. Financing options are also available.